In Building Wireless Community Networks, author and O'Reilly network administrator Rob Flickenger offers a compelling case for building wireless networks on a local level: They are inexpensive, and they can be implemented and managed by the community using them, whether it's a school, a neighborhood, or a small business. This nuts-and-bolts guide provides all the necessary information for planning a network, getting the necessary components, and understanding protocols that you need to design and implement your network. The wireless Internet infrastructure, also known as Wi-Fi, is based on the 802.11b standard. The book covers Rob's experience with the Sebastopol Community Network (NoCAT), a multi-tiered network that provides wireless access for O'Reilly employees and free Web browsing to anyone in the area who has a Wi-Fi card in his or her computer. He describes his experience in using 802.11b, selecting the appropriate equipment, finding antenna sites, and coping with the general problems of outdoor networking. Building Wireless Community Networks starts off with basic wireless concepts and essential network services, while later chapters focus on specific aspects of building your own wireless networks. The final chapter is a detailed journal of Rob's experiences in building his first community network. He begins with his first attempts at using a wireless card at a conference, covers the real-life experience of trying something new, and ends with notes from the Portland Summit, a national gathering of wireless aficionados. 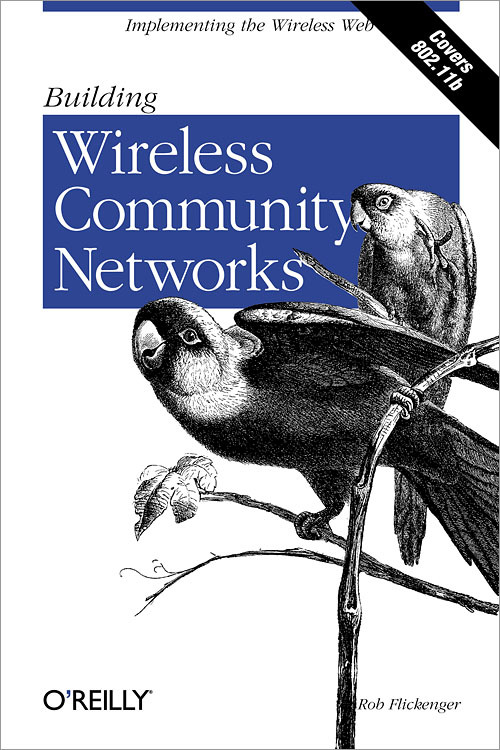 If you want to join the grassroots effort to build freely available wireless Internet infrastructures in your community, this book is invaluable.